It’s hard to believe that Lou Dobbs was ever considered a reputable financial journalist. His latest descent into Looney Tunes: he called MSNBC host Rachel Maddow a “tea-bagging queen” for her criticism of his posturing regarding President Obama’s birth certificate. I realize that Dobbs thinks tea-bagging refers in general to populist revolt, and I suspect he’s hip enough to know its other meaning. 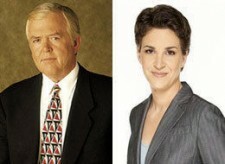 If he is, though, could someone please explain to me how Maddow, the most fabulous butch-glam lesbian in the universe, could engage in the second kind of tea-bagging? Pat Buchanan Must be Thrilled! John, Tom In “Butch” Remake? Would Royals Show Up For Lesbian Bond?